Disclosure: This post contains affiliate links, which means we may receive a commission if you click a link and purchase something that we have recommended. While clicking these links won’t cost you any extra money, they will help us keep this site up and running! 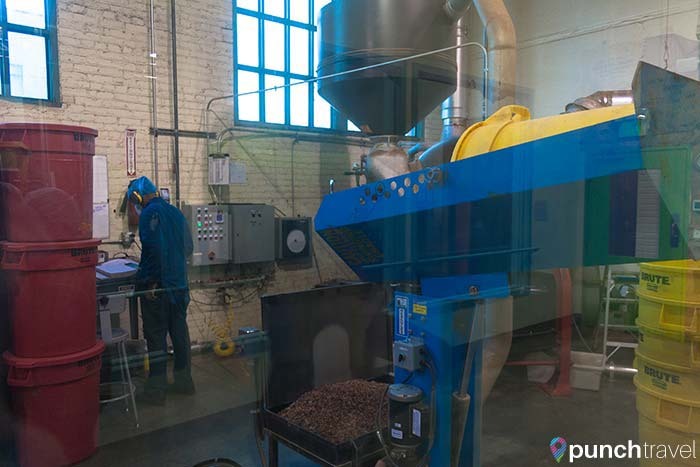 Like a real life Willy Wonka and the Chocolate Factory, you too can tour a chocolate factory! 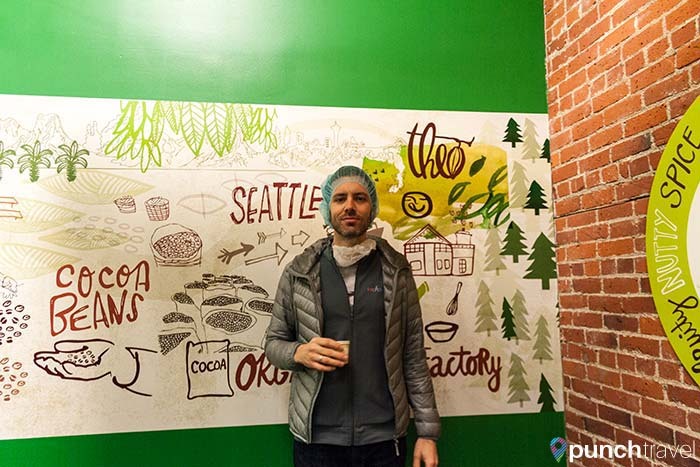 In Seattle’s Fremont neighborhood, Theo Chocolate has been providing organic chocolate since 1980. The factory is easy to find: just follow the scent of chocolate wafting through the air. The big brick building on the corner of Phinney Ave and N 35th St is unique among the office buildings housing Facebook, Google, and Adobe. 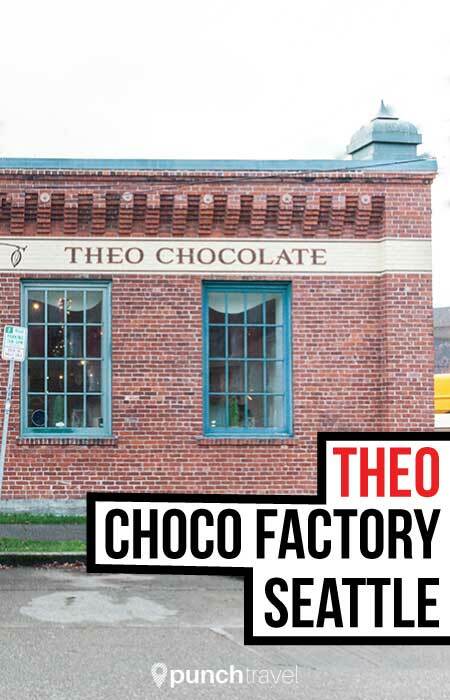 Theo Chocolate offers tours daily and last for one hour. 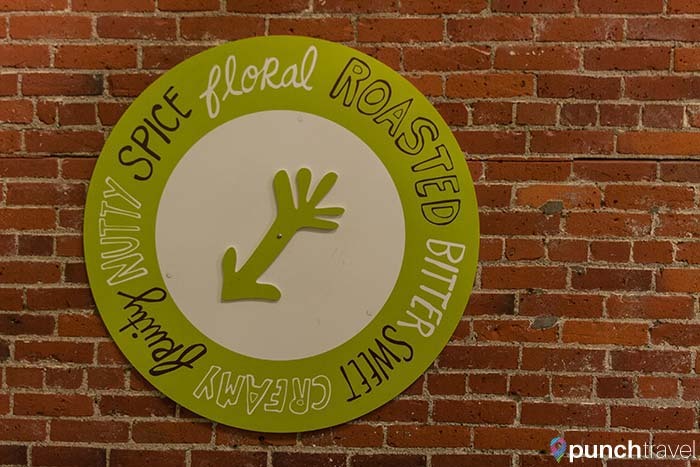 The tour costs $10 per person and includes lots of free samples! Before we could begin the tour, we had to suit up. As this is a working food production facility, certain cleanliness requirements must be maintained. We donned hairnets (plus beard-nets for the guys!) and lint rolled our clothing for any traces of hair, dust or other foreign particles that could get into the chocolate. 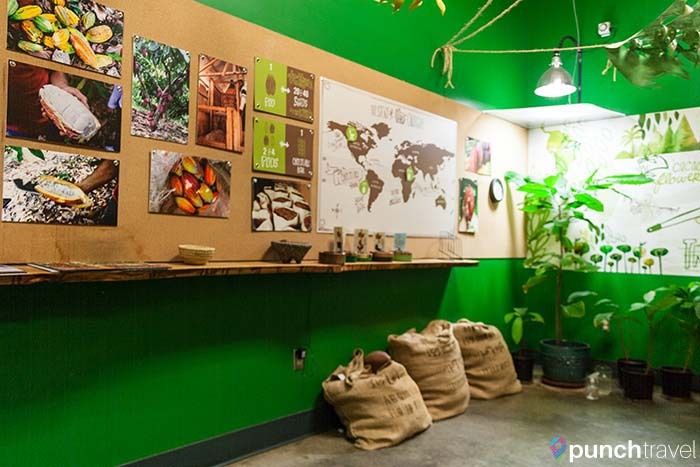 The tour began in a classroom, where we learned about chocolate production. 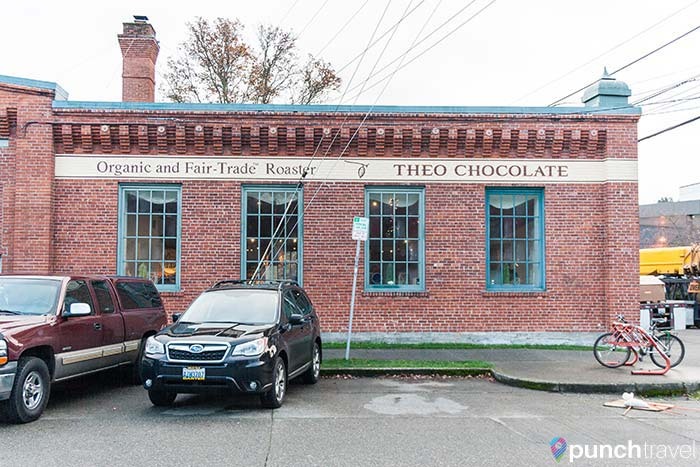 Theo is special because it was the first purveyor of organic chocolate in the United States. 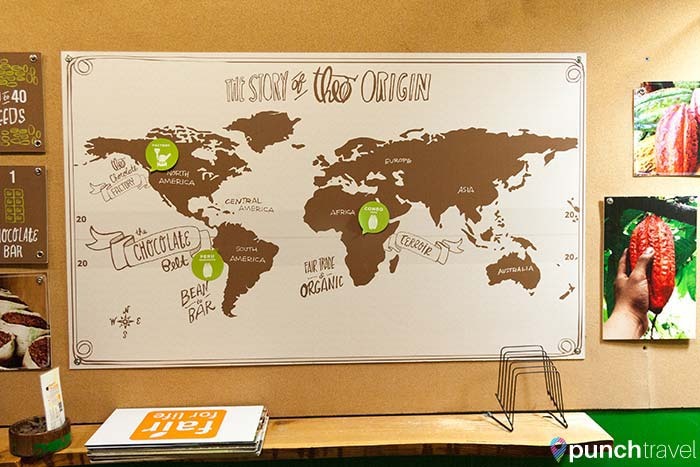 They still maintain the highest level of quality in order to meet the Fair Trade and Fair for Life organic standards. Fun fact: Most people think that Theo Chocolate is named after a guy named Theo. Wrong! The name actually comes from the seed from which chocolate is made, Theobroma cacao. As our tour guide explained the process of making chocolate, we sampled all kinds of different chocolate. I was partial to the raspberry chocolate, but the ginger chocolate was pretty tasty as well. 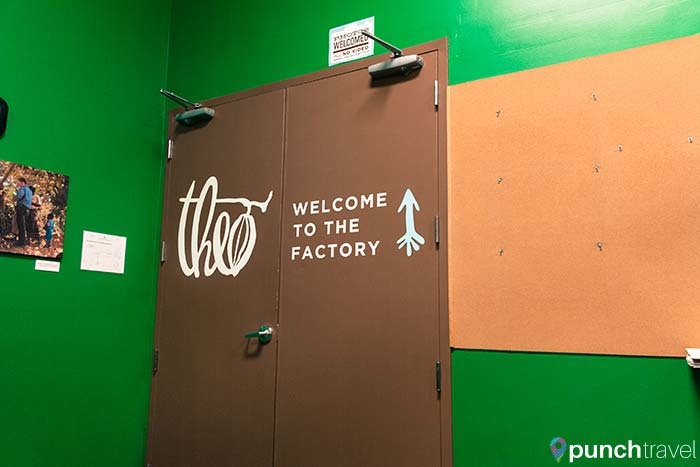 Step right through, to the magical world of chocolate making at Theo Chocolate! The factory is not very big, but it is pretty impressive what they can do. 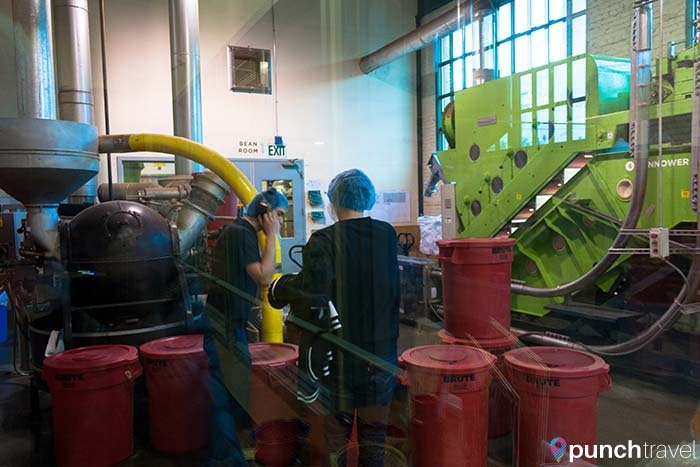 Watching from the windows, we witnessed the various stages of chocolate production. What’s exciting is that all of these steps are done right here in the Fremont factory. We learned that the machines come from Germany, and are prone to breaking down. (We saw one being repaired as we were there). We tasted cocoa nibs (quite bitter), but with a distinct banana flavor. 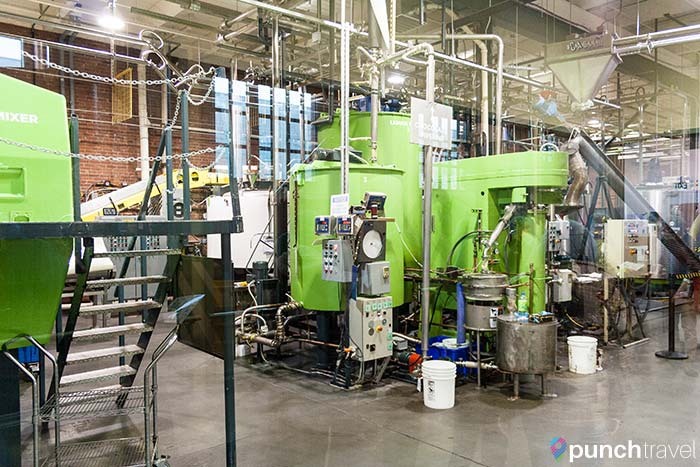 After a careful stroll through the factory floor, we entered the confection kitchen. This is where the magic happens. 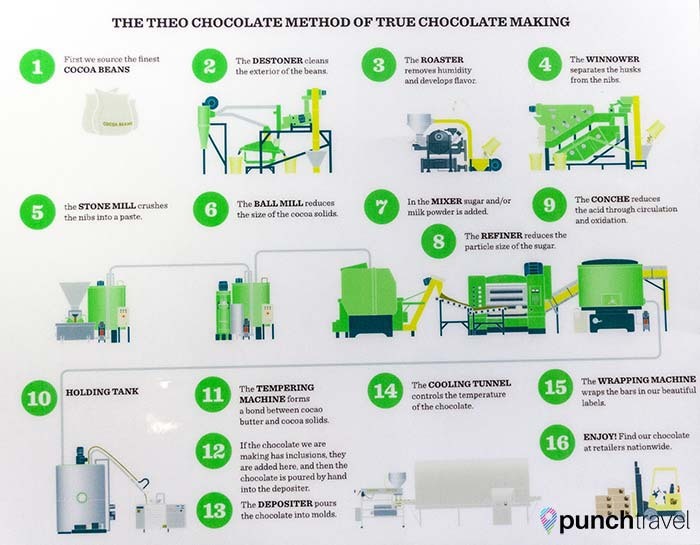 There were no oompa-loompahs (last Willy Wonka reference, I swear) but there were several chocolatiers creating the next big thing in chocolate. There was also a pretty cool Han Solo ‘frozen’ in chocolate. After more chocolate (and toffee!) samples, the tour route deposited us in the gift shop. With our appetites whetted and our 10% off coupons in hand, we scoured the store to score more of the amazing chocolate we tasted.